After teaching a very successful dance intensive for advanced dancers, we proudly present a workshops series for beginners as well! The intensive is for beginners, who aim to set up a good foundation for contemporary Jazz and Modern Contemporary Technique and who also want to work on their expression and improve their dance vocabulary. Quincy A. Junor, (New York, USA) is a native of Guyana, South America, he started his training under the direction of his mentor Gloria Moylan. He is a graduate of F. H. LaGuardia High School of Music & Art and Performing Arts(The Fame School) and he holds a BFA in Dance from SUNY Purchase Conservatory of Dance. He has attended Brooklyn Music School, The Ailey School, and Perry-Mansfield Performing Arts School–all on full scholarship. Mr. Junor has been awarded the Dr. Marvin & Carol Eiger scholarship in Dance and is a Richard & Mica Hadar Scholar in Dance. In 2002 & 2003, he was a finalist in the National Fine Arts Competition for Liturgical Dance. In 2004, he was the recipient of the National YoungArts Foundation award in choreography for his work The Chase. He has choreographed for Genesis Dance Company, Purchase Repertory Theatre’s production of Derek Walcott’s The Odyssey, and for the Neuberger Museum of Art, and was the Resident Choreographer for Teatromania Acting Company from 2004-2007, where he also went to Italy as part of their Artist in Residence program to teach and set a few of his works. He has also appeared on television in PBS/BBC’s t.v. special The Secret Life of The Brain and in a Public Service Announcement for NYC H.S. of The Performing Arts. Mr. Junor was invited to perform Mark Morris’ Gloria and Lauri Stalling’s The Great Quiet at The Kennedy Center and at the Hong Kong International Dance Festival, along with the Purchase Dance Corps. He has also performed for Dove, Stellar, and Grammy Award winning Gospel Artists Alvin Slaughter and Dr. Pastor Marvin Sapp. Mr. Junor has performed works by Alvin Ailey, Robert Battle, Pat Catterson, Patricia Dye, Troy Powell, Kevin Wynn and Nathan Trice. 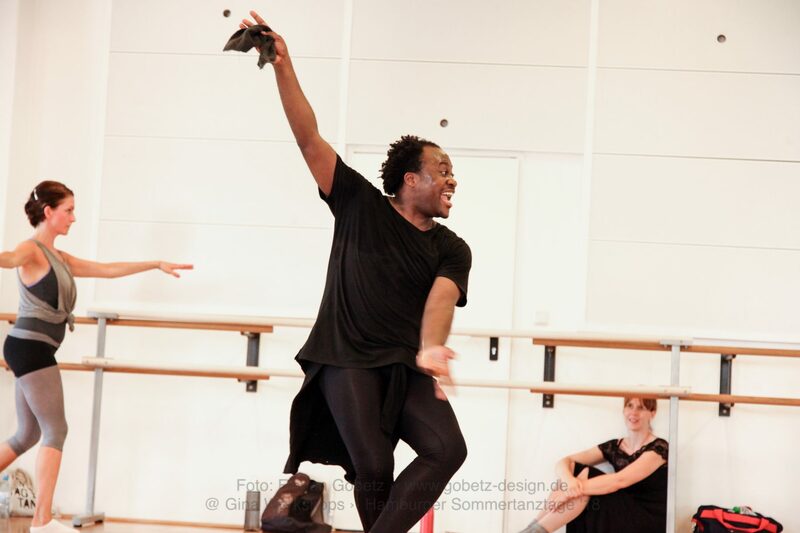 He has also performed for Errol Grimes Dance Group and Lane & Co. and was a member of Genesis Dance Company, SYREN Modern Dance and Riedel Dance Theatre. In 2009 Mr. Junor relocated to Berlin, Germany, where he continued to work in theatre, film, and tv. His theatre credits include being Choreographic Assistant, Dance Captain and dancer for choreographer Jeremy Wade for rock electric singer Peaches, for her musical production of Peaches Does Herself at HAU Hebbel am Ufer, Dancer and Dance Captain for Peaches in her one woman show Peaches Christ Superstar North America and Canada Tour, and appeared as a Guest Artist for Nature Theatre of Oklahoma’s Life & Time directed by Pavel Liska & Kelly Copper incorporation with the Berliner Festspiele/Foreign Affairs & HAU Hebbel am Ufer. From 2010-2012 he worked for TUI Cruises GmbH cruise-liner Mein Schiff I & II, first as a performer then as Junior Choreographic Manager where he collaborated on the production Qi: On The Sea with German Actress Veronica Ferres. Mr. Junor was also a guest performer with Just Live Dance Productions, the production of Philipp Arnoldt Photography music video Bong Ma and for music band Bonaparte on their Summer 2014 tour. Mr. Junor was co-director/collaborative choreographer on Lass doch mal das C weg music video for independent German rapper RO! He has choreographed for Universal Records Germany recording artist Simonne Jones for her music video Gravity and for her live studio video recordings. Mr.Junor started out in film and television in Germany as an extra in Luc Besson’s film The Lake, the hit US tv series Homeland, Marvel’s feature Captain America 3: Civil War, and as a featured extra in Yony Leyser’s second directorial film Desire Will Set You Free. In 2012, Peaches Does Herself was produced into a feature film and premiered at the 2012 Toronto International Film Festival(TIFF) then at the 2012 Festival du Nouveau Cinema, the 2013 Sundance London Festival, and the 2013 Locarno International Film Festival to name a few. Mr. Junor then went on to perform in television on Della Miles’ Global Backyard Music Special for TV.Berlin, for the hit tv series Babylon Berlin(Season 1, Episode 5) choreographed by Julia Fidel and Nasser Martin-Gousset and directed by Tom Tykwer, Achim von Borries, & Hendrik Handloegten, and lastly, in Season 2, Episode 1 of Berlin Station with choreography by Julia Fidel, all as a featured dancer. His commercial credits includes, Gat Hotels by Spanish production company Petra Garmon, as featured dancer for DEKA Investment Bank directed by Tim Löhr, Downy North America directed by Kim Nyguen, as a featured artist, as a featured actor for MEDION Electronics produced by Lovestone Film GmbH. Most recently, Mr. Junor can be seen in the new Deutsche Bahn commercial directed by Hanna Maria Heidrich with choreography by Litza Bixler with retired Formular One racing driver and the 2016 Formular One World Champion Nico Rosberg and singer-songwriter Iggy Pop and in the Make Believe music video by German artist Mignon Baer. When Mr.Junor is not performing he can be found pursuing his other artistic endeavors, firstly, mentoring and teaching. He has taught at Balance 1 Tanz Academy for their Modern Dance(Graham technique), Composition, Theater Jazz, and Career Transition courses, Contemporary-Modern and American Jazz at Motion*s Tanz & Bewegungstudio Stella Caric GmbH, and as a guest teacher at Marameo Dance Studio, Gina Workshops and master classes for high school students from Holland and Danemark. Secondly, producing and managing events such as the Berlin Dress 0.1 at Platoon Berlin Kunsthalle with Your Moms Agency, the Promotion Party for ES Collection Berlin Mens line at GMF,the film premier party for Under Electric Cloud at the 2015 Berlinale, and most recently an Evening of Dance with up and coming choreographers Mina Shayegan and Ece Cinar in collaboration with photographer Darwin Stapel.